Superman is alive and well and walking Hollywood Boulevard. Beside him is Batman, Wonder Woman, and a rather sickly looking Hulk. You can have your photos taken with them all if you want. But it’ll cost you. While it may sounds like I’m going on about some comic crossover or some huge film team-up, but I’m actually talking about the moving 2007 documentary Confessions Of A Superhero, recently released on DVD. It’s the story of four would-be actors who make some sort of living taking for pictures for tips outside of Mann’s Chinese Theatre in downtown Hollywood. I was in Los Angeles a few months ago and wound up catching a movie at the theatre (The Strangers, if you’re wondering). I noticed many of the characters walking around, but really didn’t think much about them. Commercial director Matt Ogens did, though, and wound up focusing on four extremely compelling dreamers. Christopher Dennis is obsessed with Superman and parlays his mild resemblance to Christopher Reeve into a role as the preeminent boulevard character. Maxwell Allen/Batman claims to be a former mobster with a trail of blood on his hands and a temper that could go off at any time. Joseph McQueen/Hulk walks the boulevard as the Hulk and knows the streets well, having spent a time living on them. Of all the people we’re introduced to in Confessions Of A Superhero, the one with the best shot at an acting career is Jessica Gehrt/Wonder Woman. She’s cute and funny, self-deprecating and self-aware, and seems to possess genuine talent and happiness, even as her quickie marriage is clearly falling apart in front of the camera. Confessions Of A Superhero is often uncomfortable because you’re watching people chasing their dreams, and really not getting very close. Both Christopher Dennis/Superman and Maxwell Allen/Batman aspire to be leading men, but neither appear to have any actual acting talent. Instead, the former goes back to his cramped apartment overflowing with Superman memorabilia, while the later works on film sets as a security guard while dealing with his own anger management issues. They’re characters, to be sure, but one’s that I wound up shaking my head at rather than sympathizing with. 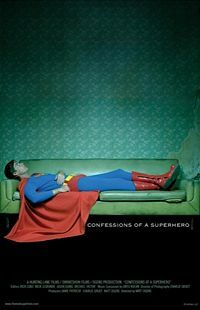 If you’re into the world of superheroes, Confessions Of A Superhero is a no brainer recommendation. It’s guaranteed to make you feel less geeky than you already do. And if you’re also a Perez Hilton/TMZ reader, you might find yourself taken in by the movie as well, with its clever and subtle commentary on celebrity culture and the lengths that some people will go to chase their dreams, all the way down Hollywood Boulevard.